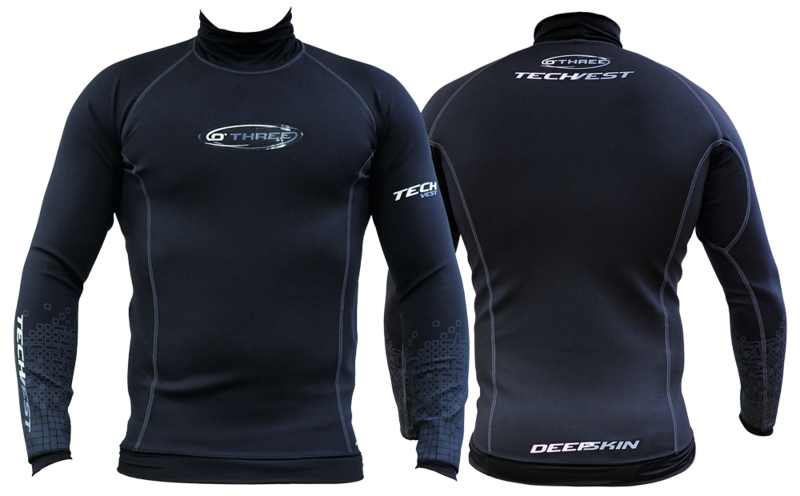 O'Three has evolved its established Deepskin range: the tech vest and the short john. This Brit based neoprene protection manufacturer states that "unlike conventional lycra rash guards, this Deepskin tech vest offers a good degree of thermal insulation". It is probably down to the material. The Deepskin tech vest is made from 0.5mm high flex glide skin cell neoprene, that helps trap water around the torso, keeping the diver warmer. The vest benefits from a high "rolled lycra" neck that sits proud up the neck, and every seam is low profile stitched. The Deepskin tech vest can be dived on its own, thereby providing UV and sting protection to the wearer, or to augment additional thermal protection, by providing an extra layer and warmth. The unisex fit vest is easy to maintain. Simply wash it in fresh water after diving, and hang it up to dry, preferably out of direct sunlight. It comes in 7 sizes, from extra small through to triple extra large.